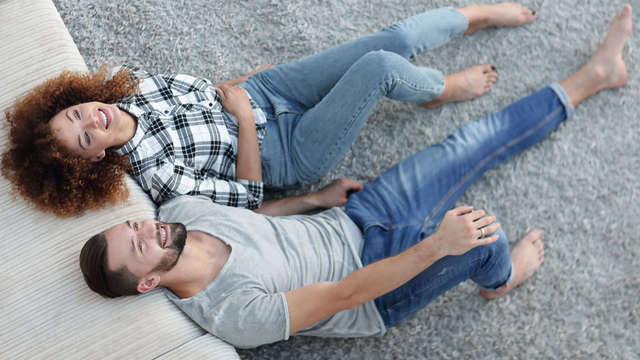 Whether you’re tired of scuff marks, dog hair, and mud tracks dirtying up your hardwood floors or are just looking for a more barefoot-friendly home environment, carpet flooring is the answer to your prayers. Deciding you want carpet is the easy part – avoiding the pitfalls associated with carpet installation can prove a bit trickier. Luckily, we’ve detailed four of the biggest carpet complications you should be aware of during the renovation process. 1. Don’t get blindsided by bad quality – With home renovations on the rise, companies are constantly rolling out trendy new styles. But, sometimes the chic designs can distract customers from the sub-par quality of the carpet. For instance, a vibrant blue shag carpet might look great immediately after the installation…but how will it look a few juice stains later? When deciding which material to go with make sure to ask questions about things like durability, sustainability, and material to ensure your satisfaction with the finished product. 2. If installation costs seem too good to be true, they might be – Installation companies love to use low prices, promotions, and discounts to appeal to customers looking for the best deal. Unfortunately, if you go with a company that cuts corners you could wind up spending thousands of dollars to correct a shoddy installation job. Companies like USA Flooring offer online style guides and preparation tips to make sure customers are kept in the loop during the entire installation process. The company’s installation teams are comprised of experienced professionals that walk homeowners through the renovation to ensure customers are never blindsided by issues they weren’t made aware of. 3. Be proactive, not reactive, when preparing for installation – This is an easy mistake to make. You’re paying someone to transform your floors, why should you do any work? With that being said, there are some precautions you can take to ensure the installation process goes as smoothly as possible. Simple things like moving all breakable items out of the rooms that will be renovated can end up saving you a headache should an accident occur. Make sure to remove all linens from beds, detach wiring from electronics, and clear flat surfaces like dressers, closet floors, and tables. 4. Don’t underemphasize the importance of carpet padding – If you’re investing in carpet, chances are it’s a long-term investment. Padding, sometimes called underlay, adds an extra layer of cushion to your carpeting in addition to protecting it from the buildup of dirt and grime. The safeguard is generally made of squishy material like sponge or foam. USA Flooring’s team of experts has experience with all of these issues and more. Whether you’re a first-time carpet buyer or a returning customer, USA Flooring guarantees a comprehensive plan that meets your specific needs. You can find more information about USA Flooring’s carpet and other services here.